I wanted to share with everyone that I recently reentered the work force. I have been unemployed (my choice) since May last year. Saturday will mark the end of my second week on the job. 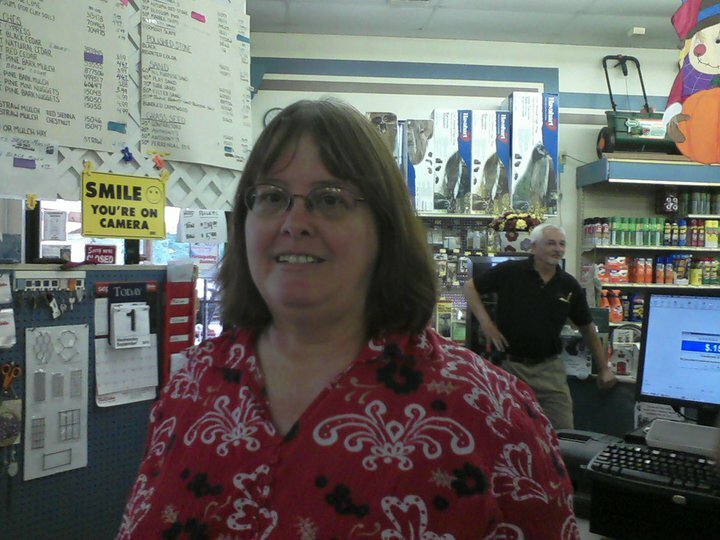 I am employed as a part-time cashier at Howe’s True Value Lawn and Garden Center. It has been more than 30 years since I worked as a cashier in a retail environment. I have learned so much these two weeks! The owners of the store, as well as all of the employees, are very nice. Here’s a picture of me at work. One of the owners of the store took this picture of me and posted it on the store’s Facebook page, welcoming me to Howe’s True Value. I have a funny story to share with you from my first two weeks on the job. One day, when I answered the telephone, a customer asked if we had any Venus Fly Traps. Near the front counter are fly catchers and fly killers, none of which are manufactured by “Venus”. When I gave this information to the customer, she politely said “you do know that a Venus Fly Trap is a plant, don’t you?” DUH! We have sold a lot of fly catchers in these two weeks. The first thing that came to mind when the customer asked for a “fly trap” was the fly catchers. I’m not much of a plant person. I think I will be learning a lot more on this job than how to ring up a sale!